I am still sifting through ideas online trying to come up with what I am going to do for my kids teachers for Teacher Appreciation Day. And not just as a mom of a student, but as class mom, so they have to be good! 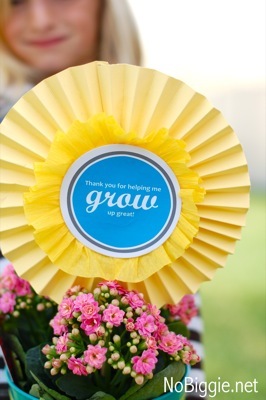 I love the idea of giving potted plants instead of flowers that won't last the week, and these cute paper medallions that from No Biggie are a fun way to dress them up. You can see the tutorial over at Skip to My Lou. There is even a free printable for the center.